Ear infections are common among cats. Just as they are in humans, ear infections are not only uncomfortable and sometimes painful, in cats they can also be a symptom of a more significant health issue. If left untreated, ear infections can lead to hearing loss or other health problems. A quick review, for those who were lucky enough not to suffer ear infections as children: Otitis media is an inflammation of the inner ear canal (which is the most common kind in humans), and otitis externa is an inflammation of the outer ear canal. The latter is the most common type of ear infection in felines. A cat with an ear infection or other ear problem will shake its head and paw at its ears. 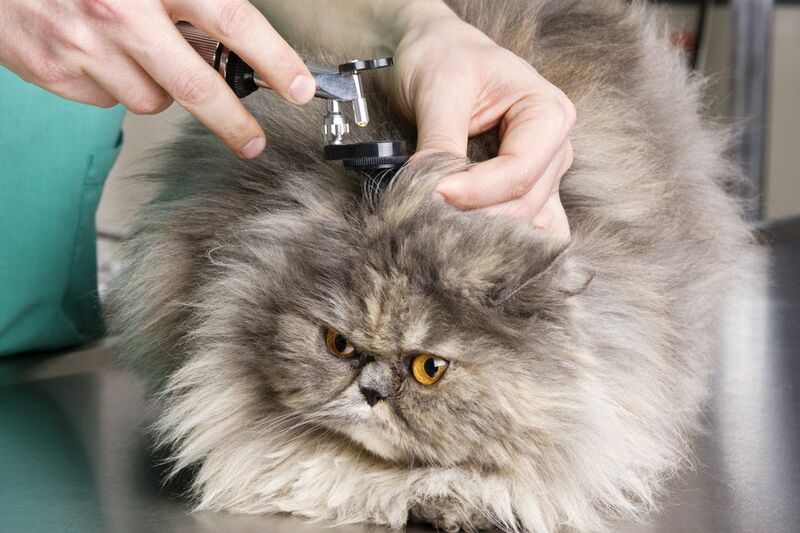 You may see hair loss or scabs around the face, ears, and neck of your pet as a result of scratching at its ears. A discharge may be present in the ears, and in severe cases, visible on the fur outside and around the ears. The ears may have an unpleasant odor or appear reddened and inflamed. Your cat may tilt its head to one side or another as a result of the ear problem. Ear infections also can cause disorientation and irritability in cats. If your cat is behaving strangely, including hiding for extended periods of time, this is usually a sign that something serious is wrong. Cat pawing at its ear in pain. There are a lot of things that may cause ear infections in cats. Most commonly, they're caused by allergies, adverse reaction to medication, parasites, a foreign body lodged in the ear, or a buildup of wax or fur. There also are several feline autoimmune diseases, such as FIV (the feline equivalent of HIV) that can result in inflammation of the ear canal. Polyps and bacterial infections also are common culprits. And just like in humans, excessive water or moisture in a cat's ear canal can cause inflammation (although you're unlikely to find cats spending extended periods of time at the swimming pool). Ear mites are responsible for approximately half of the ear infections seen in cats. In fact, ear mites might be one of the first things your veterinarian checks for if your cat has an ear infection. Ear mites cause a characteristic dark brown to black colored discharge in the ears that looks a bit like coffee grounds. The presence of this discharge is often the first indication that your cat has ear mites. Your veterinarian may also examine the debris from your cat's ears under a microscope to find evidence of ear mites. If ear mites are detected in your cat's ears, the search may stop there. However, if your cat does not have ear mites or if appropriate treatment for ear mites fails to rid your cat of the infection, further diagnosis may be necessary. The diagnosis starts with an examination not only of the ears but of the entire cat. This is because some of the causes of ear infections in cats can signal a systemic health problem. Your vet will check to be sure that your cat is generally healthy, and will carefully examine its skin and fur. In addition to an overall examination, your veterinarian will perform an examination of your cat's ears with an otoscope. An otoscope allows your veterinarian to examine the inside of the ear canal for signs such as redness and inflammation, discharge, masses and polyps, foreign bodies, and other abnormalities. Your veterinarian will also want to examine the integrity of your cat's eardrum if possible. However, if there is discharge inside of the ear canal, it may be necessary to first clean and flush the ear canal free of debris in order to be able to see the eardrum. Depending on the severity of the infection, sedation may be necessary to thoroughly flush the ear canal and examine your cat's ear. Blood testing can detect conditions such as feline leukemia and feline FIV. Food trials will be conducted if a food allergy is suspected. Effective flea treatment will rule out flea allergy as a cause of the ear infection. Testing for atopy will reveal an allergy to something in your cat's environment. Fungal cultures might be ordered if a fungal disease such as ringworm is suspected of playing a role in the ear disease. Skin scrapings can rule out other parasitic diseases, such as sarcoptic mange. While it's not really possible to prevent your cat from ever getting an ear infection, if you inspect its ears regularly you may be able to treat an infection before it becomes severe. Healthy cat ears are pink, free of wax and other debris and don't have any foul odor. A change in the color or smell of its ears may indicate that your cat has an infection coming on. Keeping your cat's ears clean is key, as well. But have your veterinarian show you the proper way to clean them; you don't want to injure your cat by accidentally probing too deeply into the ear canal. Since there are many different causes for feline ear infections, there's no one treatment that will work for every cat. In some instances antibiotics may be warranted, in others, simply cleaning and flushing the ear canal may be sufficient. Ear cytology involves swabbing the inside of your cat's ear and then using a microscope to looking for abnormal cells, bacteria, or yeast in your cat's ears. The results of this test will help your veterinarian determine which antibiotics, anti-fungal, or other medications are best used in your cat's ears. An ear culture may also need to be performed, particularly if ear cytology indicates a bacterial infection that is not responding well to antibiotic treatment. An ear culture will tell your veterinarian what type of bacteria is present in your cat's ears and test specific antibiotics to determine if they are effective in killing that bacteria.